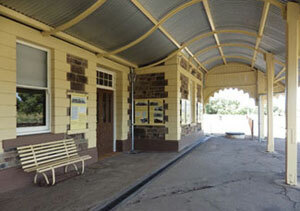 Burra Railway Station 1900. 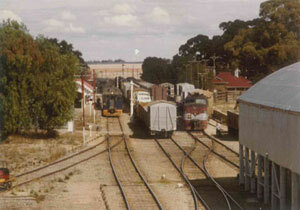 This snapshot was taken as the Terowie train pulled into the station. Collection of Ian Auhl. 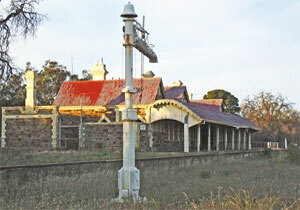 An inadequate weather board station which had been erected at Burra in 1870 was replaced by an impressive stone building, including refreshments rooms, in 1883. Sara & Dunstan won the contract. 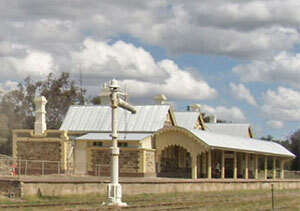 It was a busy station, being on the main line to Broken Hill from 1888, and on the route to Perth from 1917 to 1937 . 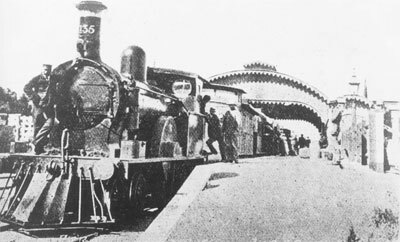 An arched roof over two tracks and the platform, providing shelter for passengers from 1870, was demolished in 1935, after which the refreshment room closed in 1936. The last passenger train ran in December 1986 and the station was closed in 1988. The last freight train ran on the line in 1999. Following years of neglect, major restoration was undertaken between 2011-2014. The restoration was managed by volunteer Roy Taplin, a retired master painter and talented carpenter. Most of the internal restoration and much of the external work was carried out by Roy, including replacing all the floor boards and repairing and redecorating the entire building. A beautiful feature of the former refreshment room is the restored freize, which was discovered under many layers of paint. In 2013 Roy was presented with a SA Heritage Hero Award, having been nominated by the Premier. 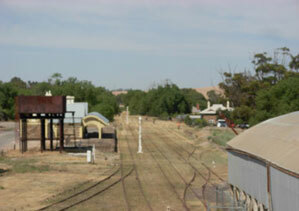 The Burra Railway Station, including the bed and breakfast accommodation, is managed by the "Friends of the Burra Railway Station" which is a voluntary group committed to the preservation of this beautiful historic building. All funds raised are intended for upkeep of the site and further development. 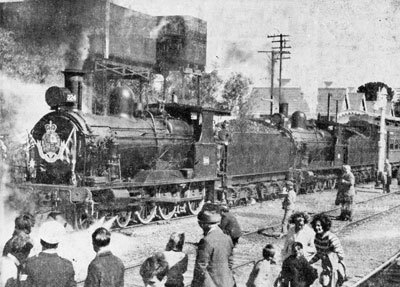 The Broken Hill express arrives at Burra in June 1908. 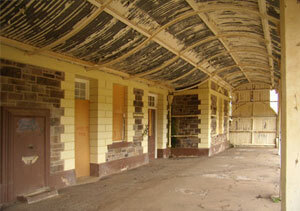 The Burra Railway Station was a refreshment stop and so then had an overhead passenger shelter. Suitably, the name of the driver standing on the engine is Mr. Ayres.